It has been two weeks since I got off the plane in Warsaw into the arms of Sylwia and Ela, my translator. I had been in England leading my annual Pilgrimage to Avalon and in Chartres teaching and helping to facilitate the Veriditas program there. I was quite full of the energies of two of my favorite places and also full of the prayers of my friends and the good wishes of the women of Dream Quest circles. Everyone who knew of my journey felt it was so important to reach across cultures and find the common ground between women the world over. The power of the journey reverberates in me still. Sylwia had assembled a crew of artists and spiritual teachers to create our sacred space. Altars were made in different parts of the room; one to the Heroine, complete with a mirror. Another honored the female deities of the world traditions. A full sized Chartres style labyrinth lay in the middle of the room. In the afternoon, I met with 8 women small group leaders who were all pioneers in Women’s Sprituality in Poland- a beautiful circle of experienced, gifted teachers. Each of them had picked a rune to focalize their group. They graciously joined the circle we have been creating for all of these years. We began with the meditation I always create for the circle of leaders. We also shared stories and walked the Labyrinth together. Soon the participants arrived. We started, as we always do, with songs. Ancient Mother was sung in Polish and English as was Return Again. As I listened to these familiar melodies with the soft sounds of the Polish language, I felt the common core of prayer and ritual resound in my body. When we sang the prayer, Come into my life, Divine Mother, the women added their own verses in Polish and English just like women in Charlottesville and Chicago and San Francisco always do. Next were the psychospiritual exercises. With Ela’s gentle translation, I invited these dancers and meditators and seekers into their bodies, meeting the maiden, mother and crone within their psyches. We created three concentric circles and called on the other circles we know- our beloveds, the ones we pray to, all of creation. 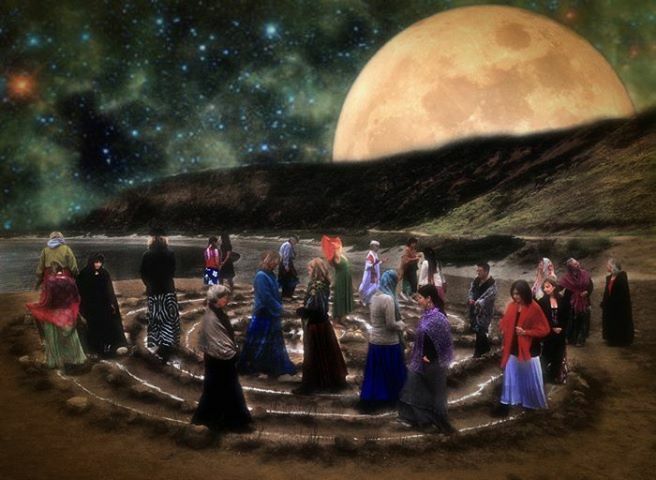 I also invited us all to imagine the women who have stood in the circle in the United States. I told them that I knew that many of them had lit candles for us and remembered us in their prayers. With a huge Shamanic drum, we began a procession circling the space, carrying candles that represented each our prayers to further nurture ourselves as heroines in our own life’s story. As each woman stood before the Heroine’s altar, she looked into the mirror and made her prayer with depth and grace. I was so moved by the ease of this ritual, remembering another circle of sisters at Grace Cathedral placing their candles on the high altar. Next were small groups and after that an evening of labyrinth walking, art , doll making, and healings. I was able to speak to many women 1-1 with some translation. Small groups met. We had another time on the labyrinth, sending our love out into the world. Then the women created wonderful skits representing their experience of the night. As I write, I am filled with gratitude for the heroines who came out to share the Big Dreaming of Women. For me, this is hope for the world. As women share, fill themselves with experience of soul and honor their ability to dream and vision our world, so much is possible. When Sylwia first translated “Women’s Dream Quest”, the literal word by word translation didn’t work. She settled on Big Dreaming of Women. I believe this is a name we have always been looking for! This entry was posted in Uncategorized on June 18, 2014 by Judith.